There’s a certain feeling one can sometimes get when looking at a weather forecast the day before going tramping, to realise the entire country is be converged on by unavoidable freezing heavy rainfall from all directions. 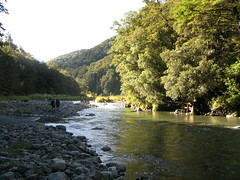 It’s a feeling that corresponds with thoughts of wanting to avoid river travel, and thus I was very surprised last Saturday to be happily wading down the Waingawa River in the Tararuas. 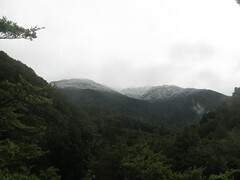 But then, you can’t really beat the Tararuas on a rainy weekend. As is generally known, the Tararuas and rain are like two magnets with poles reversed. 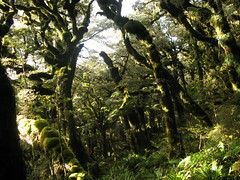 Yep, the Tararuas are awesome. 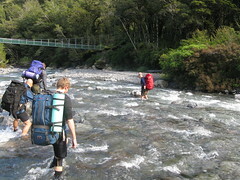 Crossing the Waingawa under Cow Creek. It seems weird going back to somewhere where I’ve been as recently as a week earlier, but that’s what I did last weekend. This time it was with the trampey club, and it wasn’t quite the same place. Instead of just walking from Holdsworth to Mitre Flats and back, we began further north at Kiriwhakapapa, then walked back to Mitre Flats before coming out at Holdsworth. 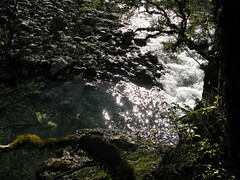 Location: Tararua Forest Park, Kiriwhakapapa to Holdsworth Road-ends. People: Steve, Daniel, Andrew, Justin and me. Huts visited: Blue Range Hut (1 night), Cow Creek Hut (0 nights), Mitre Flats Hut (1 night), Atiwhakatu Hut (0 nights), Holdsworth Lodge (0 nights). Route: Kiriwhakapapa to Blue Range Hut (Friday night), down to Cow Creek Hut via an old track to Cow Saddle, then to Mitre Flats Hut for Saturday night. Out to Holdsworth road-end on Sunday. We’d planned to camp at Kiriwhakapapa on Friday night (though it turns out there’s a shelter), but with the rain we decided instead to walk straight up to Blue Range Hut, which took between about 90 and 120 minutes (I forget), and being under trees meant the rain wasn’t too much of a problem. Usefully enough, that Friday night walk got most of what would have been Saturday’s climbing out of the way. Blue Range Hut is one of those fun huts with interesting signs and lots of character, thanks to the humour of people in the Masterton Tramping Club, but you really have to be there to appreciate it. Steve crawled out of his sleeping bag at 7.30am on the dot, and as I stared at the multitude of maps on the ceiling I could hear him stuffing things into stuff-sacks and assembling his cooker. He had a billy boiling before long, and it was time for brekkie. It took me about 20 minutes to finally roll off the top bunk, stepping outside to a chilly and crisp morning. The trees part next to the clearing outside Blue Range Hut behind a picnic table which seems to have been placed there since I last visited, offering a direct view to snow on the nearby range. It would have been cold up there overnight! Blue Range to Cow Creek. 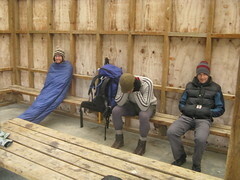 We were packed and leaving between about 8.20 and 8.30am, set to meet back at the track junction 10 metres above the hut. A brief gap in the trees allowed a glance towards Mitre Peak, hiding behind a clump of light gray clouds. 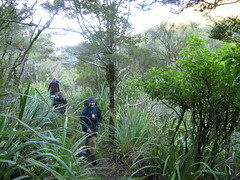 Then we were under trees again, heading towards Cow Creek Hut. A friend (Craig ) had told me earlier that there’s a very nice route directly from Mitre Flats, down from Te Mara (1104) leading west, then south-west above Donald Stream. I kept an eye out for this but I started looking too late, and missed it, but next time I’m in the area it could be an interesting route to find. Rather than walk directly to Cow Creek Hut on the marked track, we thought we might follow an old track which leads down to Cow Saddle, and then turn back towards the hut from there. This old track is shown on some older maps, and begins behind the sign at grid reference S25 213437. It then follows the ridge over spot heights 970, 890 and 810 before dropping down a spur to Cow Saddle. one end of the old track. We thought we may potentially need to do some navigation along this route. It’s actually a very clear track, though, and according to a couple of people I spoke to, in better condition than the official track to Cow Creek Hut. We didn’t actually walk along the official track, however, so I can’t say so from experience. There are no official markers along the old track (DOC, Forestry Service or otherwise), but a helpful person has marked it occasionally with fluorescent pink ribbons. Even so, they weren’t necessary at the time we visited because the track itself was so obvious. 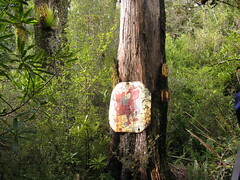 At 10.50am we emerged from behind a tree on Cow Saddle with a sign nailed to the trunk that incorporated a symbol of a cow. I’ve arrived at Cow Saddle previously having come down from Cattle Ridge on the opposite side, but on that occasion I think we must have entered it slightly further along, because at our current location there was no sign-post pointing to Cow Creek Hut. We turned left to follow the track down Cow Creek, however, and within 20 minutes and one Bus Stop Sign (nailed to another tree) later, we were on the shores of the Waingawa River — not at all flooded, which was consistent with the complete lack of rain and increasing amount of sunshine so far. There used to be a cable-way with a winch next to Cow Creek Hut until very recently, so I hear. This is now gone, and replaced by one of those mammoth new suspension bridges with wooden planks that the Department of Conservation now seems to favour. There’s a sidling track from Cow Creek around to the end of the bridge, which we duly ignored, and instead we walked around the edge of the Waingawa River and ultimately waded through the river almost directly underneath the bridge. And thus we arrived at Cow Creek Hut, too early for lunch at 11.30am. Cow Creek Hut is an old Forestry Service 6-bunker, and looks well placed in the trees. I’d like to visit it overnight some time in the future, but its location in the shade meant it wasn’t an optimal place for lunch on a day such as this. Steve wrote something in the book, which to this day I don’t know what it was, I bounded over the bridge and back — just so I could say I’d done it — we all messed around and did nothing in particular for about 20 or 30 minutes, and then we wandered south along the bank of the Waingawa River in the direction of Mitre Flats, looking for a sunny patch. We found it at about 12.30pm, a nice peninsula of rocks on the edge of the river. If we’d had wet tent flies from the previous night, this would have been a wonderful place to dry them out. For half an hour we sat around and ate lunch in the sunshine, and with a weekend forecast of continuous heavy rain, the five of us elected for a time to wade down the Waingawa River. We left our lunch spot at about 12.30pm, and potentially could have followed the river for the rest of the day, all the way to Mitre Flats. Due to some cold feet it was not to be, and 30 minutes later we decided to exit the river and instead follow the track which runs alongside. The first exit point was on the far side of a small pool in which Steve quickly found himself up to his waist before being able to climb out, and then spent a minute or two figuring out how to lever his pack and himself above an over-hanging tree root. The sight of it encouraged Andrew, Daniel and Justin to find an alternative route to the track through the trees, but it looked quite fun and I felt left out seeing Steve do something like that. As soon as it was clear there was a way up the other side, I jumped in. It was fun. It’s quite a good track between Cow Creek and Mitre Flats, which sidles along the true right of the Waingawa River for the entire distance, albeit climbing up the hillside from time to time. For a couple of stretches we ventured back into the river, and at one point a deer and (apparently earlier than I arrived) a stag came down to the river’s edge on the far side. A couple of side-creeks could flood for a while in heavy rain. One is North Mitre Stream where we arrived at about 2pm, and the other is Peggy Stream, about 15 to 20 metres south of it. After this we continued along the track which sidles up and down and through old board-walks buried 30 cm under mud, until we reached Mitre Flats at about 3.30pm. Mitre Flats was similar to how I’d left it a week before, which wasn’t too surprising. We arrived shortly after a couple of other chaps who’d walked in from The Pines, one of whom was a volunteer DOC warden, also from the Tararua Tramping Club  and a great source of information about nearby routes. I asked him about the second track up to Jumbo that I’d had trouble finding a week before, and he confirmed that it certainly did still exist. I’d probably missed it because it’s easy to coast along next to the river (where there’s a nice campsite) and completely miss the main track’s excursion slightly uphill. I guess I did this in both directions, and it’s something to keep in mind for the future. He also confirmed that the morning’s forecast for the weekend had involved the words “rain”, “hail” and “severe”, each several times and in a variety of orders. What wasn’t completely clear was exactly how the rain, hail and impending severity would manifest itself on the south-eastern end of the Tararuas, given that it was coming from the other side. Hopefully it’d be clearer by tomorrow morning, when he was scheduled to make a 7am radio call for rugby results and an updated forecast. We manufactured our Moroccan Couscous and had a nice dinner. A fly wouldn’t stop buzzing near the window, even after the candles were out, but I eventually got to sleep on the top bunk at the late hour of about 8pm. It didn’t rain much overnight. We woke to the overnight rugby results booming through Mitre Flats Hut at 7am on the dot thanks to the radio call that the helpful warden guy was making for a forecast, followed by further repetition of the words “rain”, “hail” and “severe”. The weather was quite unusual. Looking outside there was actually some blue sky, although I somehow managed to get hailed on under the blue sky. The rain and occasional hail was coming in waves, every so often being blown horizontally over the range from the west and ceremoniously landing on us. In time it began to rain more properly, and by 8am we’d all left Mitre Flats on our way out to Holdsworth Lodge. Just chugging along. For me at least, I now walked along this section exactly a week after I’d walked along it previously. This time, however, I was trying to keep an eye out for more of the side routes. 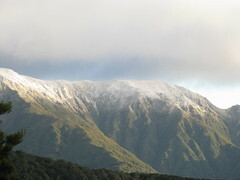 The first couple were in the vicinity of the Barton Track, which leads up an east-west spur in the direction of Baldy. My LINZ map shows a loopy bit here where one option heads about half way up the spur before going down and sidling around, and this is where the marked track leads. The second option (also shown as a track on the map) simply sidles around the lower section. A week before I’d never actually seen the division, but the warden guy had told me that the lower track split off in an obvious place. Sure enough, we did spot what was probably it heading off into the trees some way up the hill. The second route I wanted to find was the one that keeps going straight east to west up the spur to Baldy when the marked track curves around. Older maps that I’ve seen show this track explicitly and the warden guy referred to it as an escape route. I didn’t see any clear diversions from the main track for this one, but I did note a couple of places where I think it would have been reasonable to keep walking upwards on a bearing when the track curved around. between the two Baldy spurs. The rain was now hammering the tree canopy above, but it wasn’t too much of a problem with us walking under trees. Still, the weather was curious. At one point we gazed through a gap in the forest to see the great plains of the Wairarapa bathing in glorious sunshine… while we were still being rained on. There was little doubt that the mountains of the Tararuas themselves were sheltering us from a greater deluge coming from the far side, but it didn’t feel like it. 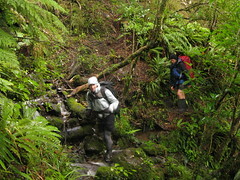 We reached the washed out side creek north of the south-east Baldy spur at about 9.20am or so, at a guess. It was very straightforward, unlike when I was on my own a week before and had driven myself to unnecessary concern. We left Baldy Saddle shortly before 10am, and after a 15 minute slippery slide down the southern side, we crossed the bridge over the Atiwhakatu Stream. Doubtlessly my moment of triumph. I know I can navigate! The next route I needed to tick off my list from missing a week before was embarassing, because the northern track leading up to Jumbo Hut is a well maintained track that many believe to be in better condition and more interesting than the more popular Rainguage Spur. At 10.20am I caught up with the group at the front who were aware I was looking for it, and were milling around the giant bright yellow and green Department of Conservation sign in the middle of the track, wondering just how I could have missed it. I’m now fairly sure what happened was that in both directions, I’d followed the edge of the Atiwhakatu Stream too closely instead of the track markers. This is a generally safe thing to do, but at that exact point the track leads up the hill slightly to the junction with the track up to Jumbo, whereas I’d continued to walk through a nice camp-site below it. Steve took a photo of me standing behind the sign, so I can now prove that I’ve found it. 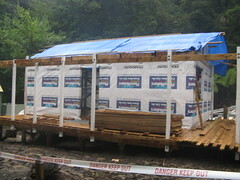 Atiwhakatu Hut now has walls. 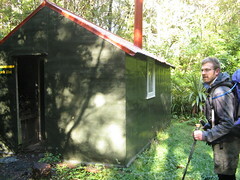 The next stop, now at 11am, was Atiwhakatu Hut. Its building had progressed even further than the wooden framing of the previous Sunday, to the point that it actually had walls embossed with Placemakers logos. The DOC-warden guy back at Mitre Flats had mentioned it supposed to be the same design as Roaring Stag Lodge, and it’s now finally beginning to look like it. Of course, with all the rain, the builders were hiding inside the old Atiwhakatu hut with smoke pouring out and having slapped a giant piece of “DANGER KEEP OUT” tape over the door. At one moment Steve attempted to get a closer look at the construction site, until one of them shouted out the window that he should keep out. Fair enough, I guess. It’s still a building site, after all. 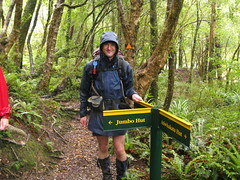 With the constant rain things were going rather quickly, and they only went faster from this point on because the track between Atiwhakatu Hut and Holdsworth Lodge is practically a State Highway. At 11.45am we walked past the junction heading up to East Holdsworth, at 12.20pm we cruised through Donnelly Flats, and at 12.35pm we exited past Holdsworth Lodge, having seen only a single person heading the other way for a short walk. Perhaps the forecast frightened people away. I tried to write in the book at Holdsworth Lodge but gave up after a minute because my fingers, which had been rather exposed to the wetness, were rather numb and unable to accurately control a pen. Having attempted several methods of using one hand to push the other, I decided that there was little chance we’d be abducted by aliens between now and our collection, and so it’d be unlikely that anyone might consult the book to confirm we’d gotten out, anyway. We probably could have stayed in the lodge for the 80-90 minutes until our collection, but it wasn’t very handy to the road. Thus, we ate our lunch and left-over chocolate in the shelter above the Holdsworth parking area, watching as several waves of rain came through. Quite a sombre way to end the weekend, but it was a good weekend. Considering just how much rain was expected, we were fortunate that everything went perfectly such that we didn’t need to resort to any of several backup plans. Saturday, especially, was a gem of a day. It was almost disappointing that we weren’t really equipped to go up onto the tops in the Tararua snow, but I know there will be future times.